Tuli Elizabeth Costa is a young woman of 22. She is a student and recently finished her higher secondary education. She has been living with her uncles since losing both her parents five years ago. By the age of two, Tuli still could not stand or walk, as her left leg was shorter than the right and had less strength. She learned to walk slowly. When she was 4, her parents brought her to CRP for treatment and rehabilitation. She received therapeutic services here to strengthen her muscles and to enable her to walk without support. After passing her Higher Secondary School Certificate (H.S.C) exam, she applied to receive computer training at CRP’s Madhob Memorial Vocational Training Institute. As a disabled person, Tuli was enrolled onto this six months program in January, 2017. When attending her classes at CRP, she heard about other training programmes supported by the Manusher Jonno Foundation and other donors, including the mushroom cultivation program, which interested her greatly. She thought about the empty space beside her house, and set her mind on producing mushrooms there both for home consumption and for selling as a source of income. Tuli joined a one months’ mushroom cultivation training programme at CRP, and after the training she started to grow mushrooms with her aunt at home. 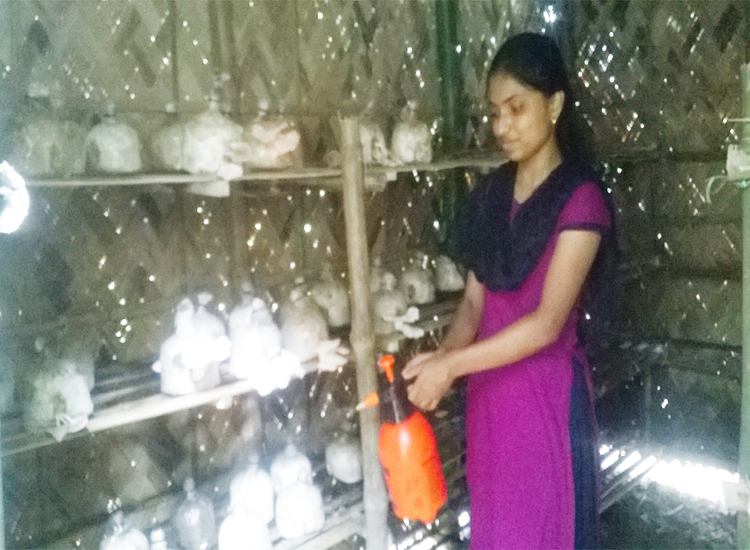 She is planning on being admitted to Savar University College to take up a Bachelor Degree, while still continuing with her small mushroom cultivation business.